The best answer to this question is “we do not know who wrote the book of Hebrews.” It is an anonymous book and the earliest suggested author (Paul) is rarely defended today. This also means we know very little about when the book was written, the original audience, or where the author was when he wrote. This is remarkable since we can know all these things with a high level of certainty for many of Paul’s letters (especially Romans, 1-2 Corinthians or Galatians). But there are a number of things we can know about the author of Hebrews from the book itself. The author was a Jewish Christian, but undoubtedly a Hellenistic Jew. This would account for his detailed knowledge of the Hebrew Bible as well as his use of the Septuagint. The author regularly links verses together based on key words and themes to create chains of texts to support a his point. This method is found among the later rabbis and was probably the way a synagogue sermon was constructed. The author was highly educated in both the Hebrew Bible and Hellenistic philosophy. Scholars often point out the similarities between the book of Hebrews and the writings of the Jewish philosopher, Philo of Alexandria (30 B.C. – A.D. 50). It is possible the author was educated in Alexandria since he reads the Hebrew Bible in ways which are similar to Philo. But as James Thompson observes, the parallels between Philo and Hebrews are insufficient evidence to prove the author knew Philo or his exegetical techniques (Hebrews, 24). The author may have been in the second generation of the church. Hebrew 2:3 implies that the writer has received tradition from others who are the witnesses of Jesus. While this could imply an individual living in the 60’s who not from Judea, it may only mean the author was not a follower of Jesus until after the resurrection. On the other hand, the writer could be someone who heard the message of Jesus as a youth from of the now elderly apostles, allowing for a date well past A.D. 70. The author was influenced by Paul. It is hard to imagine a writer in the first century who has not heard of Paul, so this does not require him to be a companion of Paul or even part of the Pauline circle (Barnabas or Timothy, for example). Unlike James, the author of Hebrews did not make a conscious effort to deal with similar topics as Paul (justification by faith) nor is there a direct reference to Paul (as in 2 Peter). Undoubtedly the writer read or heard Paul and knows his theology. This helps explain how a tradition of Pauline authorship might have developed in the first place. None of these points should be controversial. As it turns out, there only a few people mentioned in the New Testament who fit this description. Other than Paul, the obvious candidate is Apollos since he is from Alexandria, was a well-educated Hellenistic Jew, and had some influence from Paul or Pauline theology. But there are other candidates: Barnabas, Aquila and Priscilla, or even Timothy have been suggested as as potential authors of the book. How do these four points help us to make sense of the content of Hebrews? To what extent does the author’s anonymity hinder (or help?) our understanding of the book. Very helpful summary – thank you! Would you say that the masculine participle used by the author in 11v32 rules out a female writer? Thanks Rob. I am not sure it “rules it out” at all, on the basis of a “generic masculine” I suppose; the suggestion that Aquila and Priscilla were co-authors would allow for a kind of generic masculine there. Are there any documents in the whole Greek Literature that we know come from a woman that have a similar self reference (a participle)? I am not aware of any, but I have not looked for one either. Perhaps a letter in the papyri? My guess is that a woman would use the feminine, but there may be examples of women using a generic masculine participle in this kind of context. Another possibility is that διηγούμενον refers to the account of the other prophets, not the writer’s account (a substantive use of the participle). I am less than happy with that grammatically, but if I was committed to a female writer I could make it work! That sounds good to me! 🙂 I will soon be reading a book that makes the case for Priscilla’s authorship… I’ll have to let you know when I’ve read it and what I think. What is the book? Author/Title? I was unaware that there was a sustained monograph sized argument for Priscilla. Oops–disclaimer… that’s an affiliate link for Words on the Word. Doesn’t change anything–just so used to using that page for the blog! I was once told after I did a sermon on Hebrews 4 at a GGF church that Paul was indeed the author of Hebrews. I had said that it is unknown really, but one member of the congregation made it quite clear to me that he believed Paul wrote it, plain and simple. But as much as it seems to carry Paul’s theology, I think there are too many distinctions to prove that he wrote it. I would fit in with what P. Long says here, that the author was influenced by Paul. In Hebrews 2:3, the author includes himself in the group of people that had the gospel confirmed by those who were with the Lord and heard him announce salvation (Jobes 39). This, and the different writing styles seem to point away from Paul as being the author. The four points that P. Long has here do explain some of the content such as Jesus as High Priest and the extremely sophisticated language in Hebrews. If the author was a Hellenistic Jew that was highly educated in the Hebrew Bible, it would make sense that the author would be referring to very Jewish topics and stating his points in an elegant manner. I am sure you were sensitive to your elder brother when you responded, right? I admit there are times the book seems like Paul, and others that are alien to Paul’s thought. I (personally) cannot be dogmatic on the authorship of the book. But….see my next post, Josh, for the possibility of Pauline authorship. Yes, I followed the advice of the penguins from Madagascar…’just smile and wave boys’. I think that the book of Hebrews is an interesting book as according to its context. From my understanding, it kind of speaks to both groups of people, Jews and Christians. One of the main purposes of the book is to portray Christ as perfect and superior, which is obviously where the difference between Judaism and Christianity comes in. The writing in book is also focused on Christians who are being persecuted, and encouraging them to keep their faith in salvation. What we know is that Christology is definitely written about in Hebrews. For that reason and others, I think we can be safe in believing that the writer was influenced by Paul. The writer was also educated in what the Bible said, was a Jew, and may have not been a follower of Jesus until after the resurrection. With all of these facts combined, I think that we can say that Hebrews is a book of strong, Christ-centered theology, and also speaks to the culture of the Jews. The four points give clarity to the contents of Hebrews. As Chris has stated above, “I think we can be safe in believing that the writer was influenced by Paul. The writer was also educated in what the Bible said, was a Jew, and may have not been a follower of Jesus until after the resurrection.” We will never know the true author of Hebrews, but these four points shed light on the reason why Hebrews says what it does. The most interesting of these four points for me is the one about the author being a highly educated Hellenistic Jew. You mention in the main post that Hebrews shares “…a number of similarities to the writings of Philo of Alexandria.” It would be interesting to know more about what these similarities are, and how they have influence the content. You mention that the author may have been educated in Hellenistic philosophy, I am curious to where that plays a role in the content of Hebrews? If it makes use of philosophy, could Hebrews have appealed to more than just a Jewish audience? The author addresses issues that would seem to be important to the second-generation church rather than the first. The second generation had to deal with the identity of Christ and the relevance of the law in the light of the new covenant more than the first. This is why I think the author puts stress on the concept of Christ’s priesthood “after the order of Melchizedek”; in order to show that Christ’s covenant is beyond and therefor better than the old. Also, the analogies of Hebrews implies a reliance on Platonic dualism. This is why it is referred to as Hellenistic. I agree with Ty that Hebrew appealed to more than just Jews. The author may have intended for his (or her) message to reach traditional and Hellenistic Jews alike. 1. Peter wrote Christian Jews scattered abroad and defended Paul’s letter to the same readership. Hebrews is the only letter Paul could have written to Jews and with the same subject matter, a new heavens and earth (2 Pt. 3:13-16; Heb. 11:10; 11:14-16; 12:22; 12:25-29.). The Holy Spirit using one writer to defend another writer’s credibility is unprecedented but necessary since Paul wrote the Jewish Christians. 2. Stephen who performed signs and wonders preached the gospel to Paul though at that time Paul was not teachable (Heb. 2:3-4; Acts 6:8: Acts 7:51 – 56). Stephen preached to Paul and the Jews that they were sinners, Jesus was the Son of Man, resurrected, at the right hand of God, forgives sins and the keeper of his spirit. Paul referred to Stephen as Jesus witness. Paul fit well the Heb. 2:3-4 description. 3. The Lord directly taught Paul a fuller understanding of the gospel and its ramifications so that he could refute the Judaizers after he was saved and left Damascus (Gal. 1:11-17). Even Ananias spoke the gospel to Paul before baptizing him and Paul receiving the Holy Spirit. The thief on the cross had a very limited knowledge of the gospel which was all that was required to be saved. 4. The Hebrews letter was not anonymous, the writer expected the readership to know who wrote it (Heb. 13:18). The church generally has thought Paul was the author until the 18th century. 5. The writer had a close but superior relationship with Timothy (Heb. 13:23). – Paul/Timothy have a spiritual father/son relationship (Phil. 2:22). 6. The writer was in Italy (Heb. 13:24) and in prison (Heb. 13:19) – Paul was imprisoned in Rome. 7. John wrote 5 letters with different writing styles. Is that a basis for rejecting John’s authorship? Neither is Paul’s writing style in Hebrews a basis for rejecting his authorship. This is not a matter to be contentious about. Ultimately the Holy Spirit wrote Hebrews. It is a wonderful book second only to Romans. I will correct #7, John’s gospel and the three epistles are remarkably similar, there is no question they come from the same author. Revelation is radically different in literary style, but there are some clear theological themes connecting it to the Gospel of John. FWIW, for many scholars the John of Revelation is not the author of the anonymous Gospel of John. Because there is no author identified, Hebrews is anonymous even if the author expected people to know who he was. If Paul authored Hebrews, would he not have argued that his brethren in the flesh go beyond the New Covenant, all the way to the mystery revelation he had received? Or, is this a prophetic “love” letter penned by Paul for his brethren, but meant for a future generation, say a true Israel facing Jacob’s Trouble? Check back tomorrow, I have a post scheduled on Paul and Hebrews. Best case scenario for Paul as the author is this is a synagogue sermon preached by Paul early in his career, someone like Luke or Apollos edited it into the document we now have. Barnabas has always been my favorite contender, and for entirely emotional reasons that have no relevance to the evidence. I’m intrigued by Barnabas because he is so quiet. He doesn’t have a single speaking line, and is hardly ever depicted saying much of anything. He tends to accompany Paul while Paul does all the talking. Despite that, he is of such central importance – without his influence in Jerusalem, would we even know who Paul is today? So I’ve always liked to think that Hebrews is our chance to finally hear what Barney has to say – whether or not there’s any compelling evidence for his being the author. An intriguing argument for Barnabas is the frequent use of “encourage” in Hebrews, and Acts 4:36, Joseph the Levite was nicknamed “Son of Encouragement.” He is Levite, accounting for the interest in the Temple and has a Pauline influence. It is not implausible for Barnabas to have written the book, so your emotional reasons have some rational support. 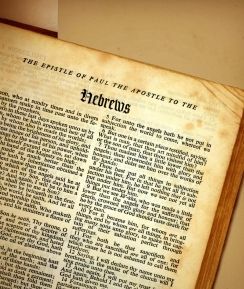 I have read these blogs, “Who wrote the book of Hebrews”, and “The author of Hebrews- Why not Paul”. As a novice on this entire subject, they are ‘deep’ and somewhat beyond my limited scope of knowledge. I have read the many comments and the textbook by Jobes. Every argument from Clement and Origen to Calvin and Luther sounds plausible. Maybe Paul wrote it, maybe he did not. I am in agreement with the first sentence of this blog “We do not know who wrote the book of Hebrews”. However, my mind goes to this thought; (and at the risk of showing my ignorance), why does knowing who wrote it matter so much? I accept the entire Bible as the accurate , inspired Word of God. 2 Timothy 3:16 says, “All scripture is breathed out by God and profitable for teaching, for reproof, for correction, and for training in righteousness.” God-Breathed. Does it matter who wrote it down? Perhaps, by the end of this Jewish Christian Literature course I will have a better understanding of the importance of authorship, in the meantime my focus will be to study and follow it. I agree with you McKenzie, I feel that many times we do not always think about the context in which a book of the Bible is written. We only start looking into those thoughts and ideas when someone brings them up. Because of this, it makes it hard to have a set opinion on the topic. Reading “Letters to the Church”, blog posts, and listening in class; I think really opens our eyes to the things that are unknown about the book of Hebrews such as who wrote it. It will be interesting to see how the importance of an author of a book of the Bible affects the way that we read and understand it. I think that it is interesting to hear and read about all of the different ideas that people come up with when it comes to the book of Hebrews: who wrote it? Who was it written for? According to our in-class textbook “Letters to the Church” by Karen Jobes, some think that the book of Hebrews may have been a sermon for a group of people instead of a letter (Jobes, 2011). As Jobes points out the last chapter in Hebrews is a, “clear indication that it was sent as a personal correspondence to a specific group of people that the author had in mind” (Jobes, 2011, p.44). When looking at Hebrews 13: 20-24, it comes across as the closing of a letter; especially when it says, ” But I urge you, brethren, [h]bear with [i]this word of exhortation, for I have written to you briefly…Greet all of your leaders and all the [k]saints. Those from Italy greet you” (Hebrews 13: 22,24). From those verses I personally think that the book of Hebrews was a letter written to a certain group of people. These four points help us to make sense of the content of Hebrews by giving us a basic understanding of what the author was like, and where most of the knowledge is coming from. Not knowing who the author is helps us to understand the book of Hebrews with an open mind because let’s say someone doesn’t like Paul’s writing and they think Paul wrote Hebrews that person might not want to read it, but not knowing who wrote Hebrews gives the person an open mind to reading the book. It also hinders our understanding of the book because we do not have a strong grasp on when the book was for sure written and how close it was to Jesus’ resurrection. The book of Hebrews is considered anonymous and there are many indicators that give us general ideas about the plausible author. The post from P. Long along with the text says that Paul is a possible author for the book of Hebrews. “In the earliest manuscript editions of the New Testament books, Hebrews is included after Romans among the books written by the apostle Paul. This was taken as evidence that Paul had written it…” (Jobes, 36- 37). I had similar thoughts to those of McKenzie McCord when she points out possible ignorance of wondering why does it really matter? I have heard many cases of the need for knowledge about context, audience, and authorship, but I still wonder why it changes the meaning in many cases. Scripture says in John 1:1 says, “In the beginning was the Word, and the Word was with God, and the Word was God.” So if the Word was with God and the Word is God, does the author really influence the meaning? I think there are more important pieces of knowledge like the context of the Word rather than the author. It could also be positive that the author is unknown because readers can not judge or be biased to a certain authors that they like/ dislike. These four points help us in a couple different ways. Not knowing who the author is keeps us from comparing the points to other authors in the new testament. This allows for us to keep an open mind, and i would bet that it allowed the early church mostly Hellenistic Jews to keep an open mind and be accepting of the New Testament as well. The second is it gives legitimacy to Paul’s influence to the early Christian world. There is definitely influence in the way he writes the letter, especially when it comes to the athletic aspect of the early Christian world. In the end all of Scripture is God-breathed and only God himself will fully know who he inspired to write this scripture.